Boulder Ridge Mobile Home Park is a picturesque community for adults 55 and older located in Northwest Phoenix. 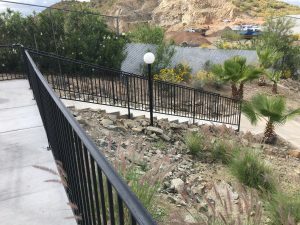 At the urging of their insurance company, the property managers at Boulder Ridge were looking to add an outdoor stair railing, as well as railings to enclose an outdoor seating area. 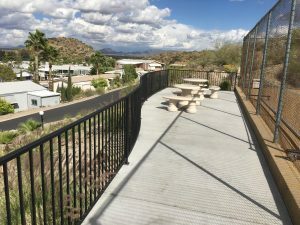 In addition to keeping residents safe and complying with the insurance company’s requirements, the managers wanted to make sure that the railings would enhance the beauty of the property. Aside from railings, DCS Industries produces a variety of wrought iron products, including gates, fences, and security doors, for commercial and residential properties. We believe that wrought iron is an excellent choice for most properties because it is naturally sturdy, has an elegant appearance, and can easily be customized to suit different styles. All of our products are crafted using premium-grade, 16-gauge steel to ensure long-lasting durability. We also offer the option of galvanization with a twenty-year warranty. Galvanization is the process of coating the wrought iron with zinc in order to safeguard against rust and deterioration. The DCS Industries team works closely with customers to determine the best solution for boosting the property’s safety, beauty, and functionality. As an added bonus, we control each step in the production process—allowing us to pass cost savings onto our customers. Wondering if your property would benefit from a new wrought iron fixture like the railings installed at Boulder Ridge? Contact DCS Industries today at 623-825-7700 for a free evaluation!